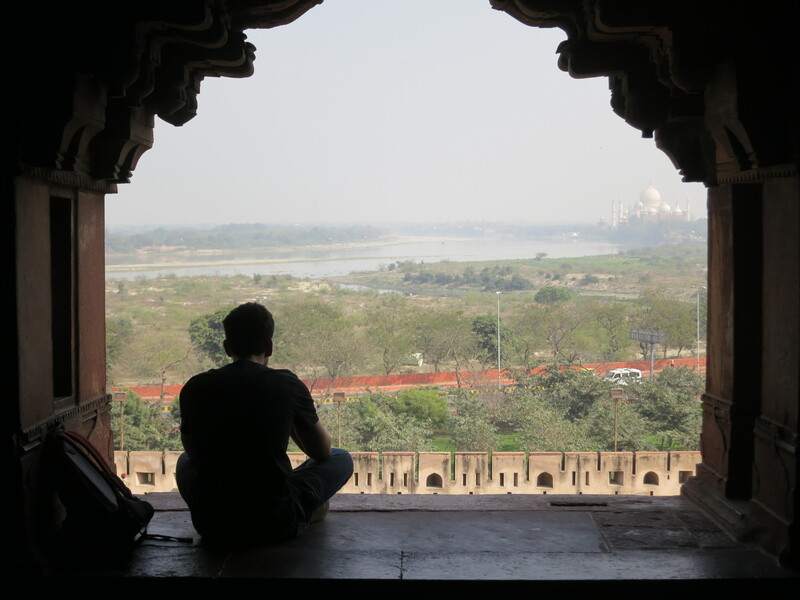 Whenever planning one’s first trip to India, there are normally a few usual suspects that top this list as far as potential places to visit: Delhi as a port of entry, Varanasi for the spiritual bath in the Ganges, Rajasthan for the forts and temples, Mumbai for the modern city vibe, Goa for laid back beaches, and Kerala for the backwaters. 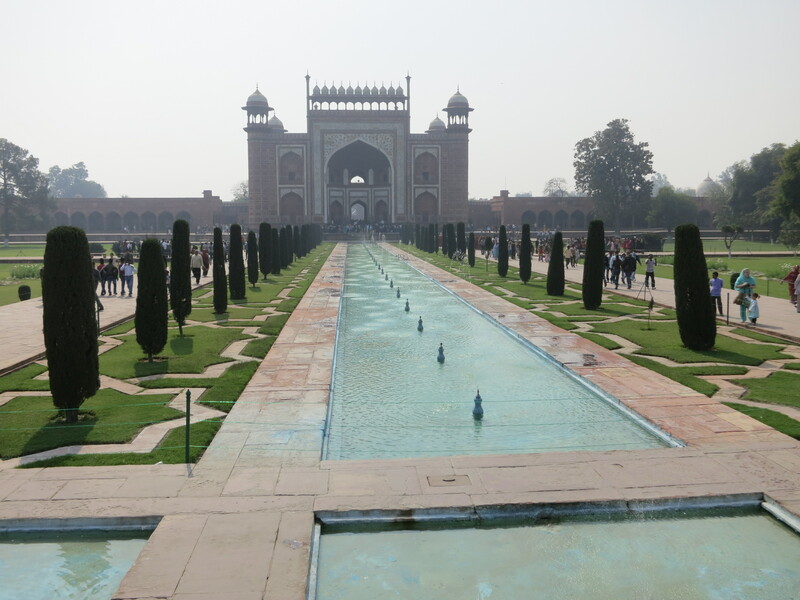 But almost unequivocally, one stop that is included on every itinerary is that of the city of Agra — located about a 2-3 hour train ride to the Southeast of New Delhi — and with good reason, too. 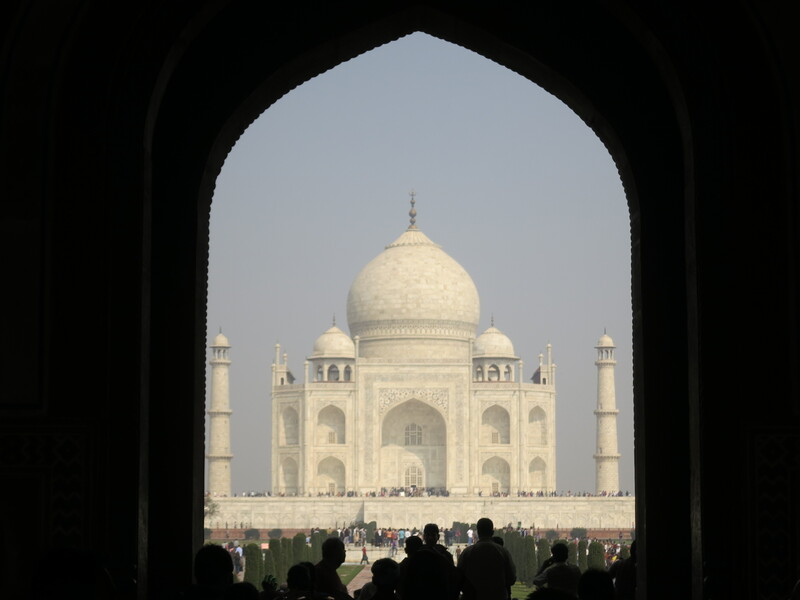 Although the city itself can be an interesting exercise in cultural immersion, the main draw for tourists — both Indian and foreigners, alike — is that of the iconic Taj Mahal, one of the most recognizable buildings on the planet. 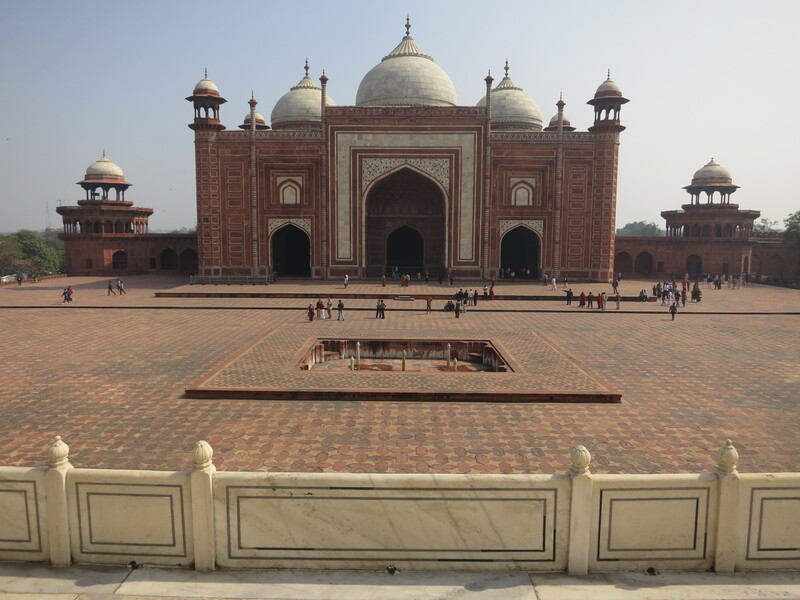 Completed in 1653, this majestic mausoleum was built by the Mughal emperor Shaj Jahan as a monument of love for his third wife. Before she passed away after giving birth to their 14th child (yes, they were busy folks), his last words to his beloved were that he would build a monument in her honor that no other building in the world could rival. 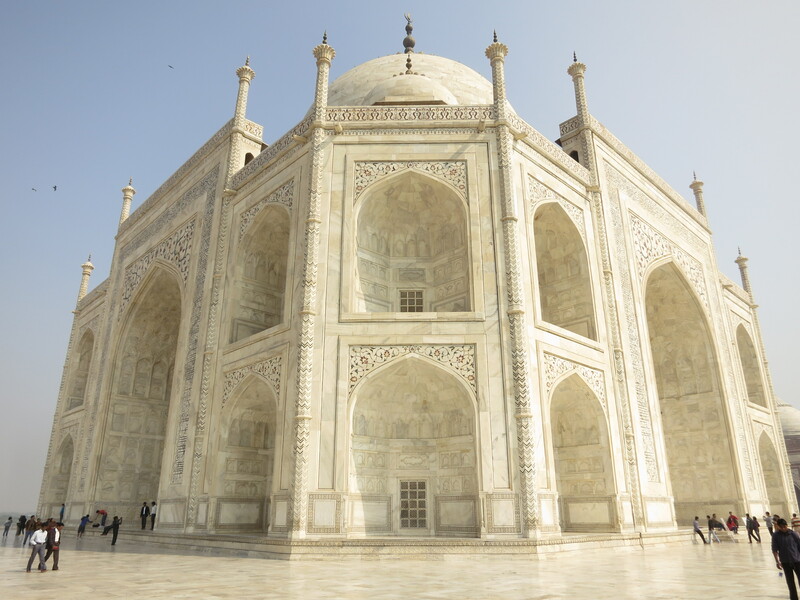 The task took over 20 years and employed nearly 20,000 craftsmen and laborers to complete, but the result, the Taj Mahal, was exactly as Shaj Jahan had predicted, a building so perfect that it is widely accepted as one of the most beautiful pieces of architecture to be found anywhere in the world. The attraction of the structure is inherent in its design, but there are also several key factors that help to contribute to its beauty. 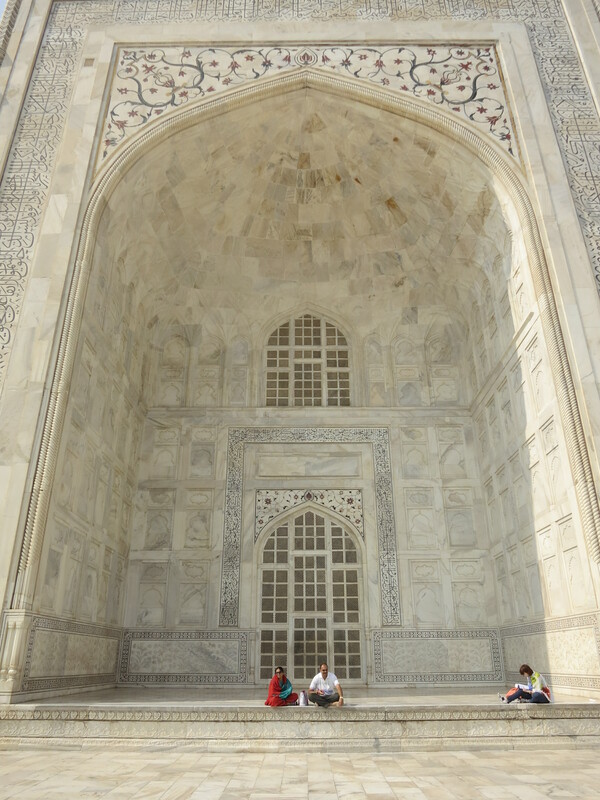 As can be seen with a quick glance, the entire monument is perfectly symmetrical upon all four sides, which regularly causes confusion amongst travelers when the return home and try to remember which photo is of which side (the only non-symmetrical feature is that sarcophagus for Shah Jahan’s wife herself, set slightly off to the side from his own). Further, the building itself is constructed of a semi-translucent, white marble, which, in the face of sunlight, makes it appear as if the building has an internal light sources that glows from within. And, depending upon what time of day you visit, the color itself seems to change: taking on a pinkish hue during the sunrise, a heavenly white at midday, and a slightly yellowish/gold tint at sunset. 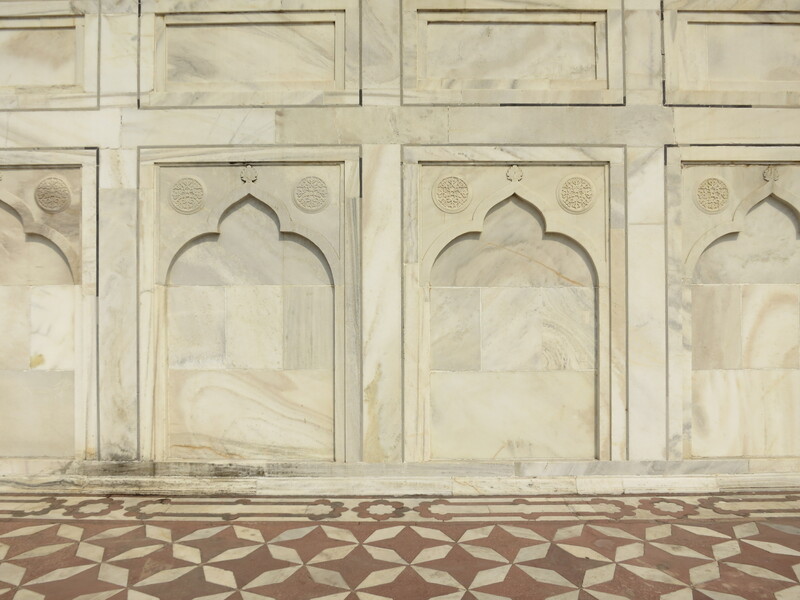 The entire building itself is also built atop another marble plinth, raising it several more meters off the ground, the result of which is the only background you’ll see when gazing upon the structure is that of the sky. 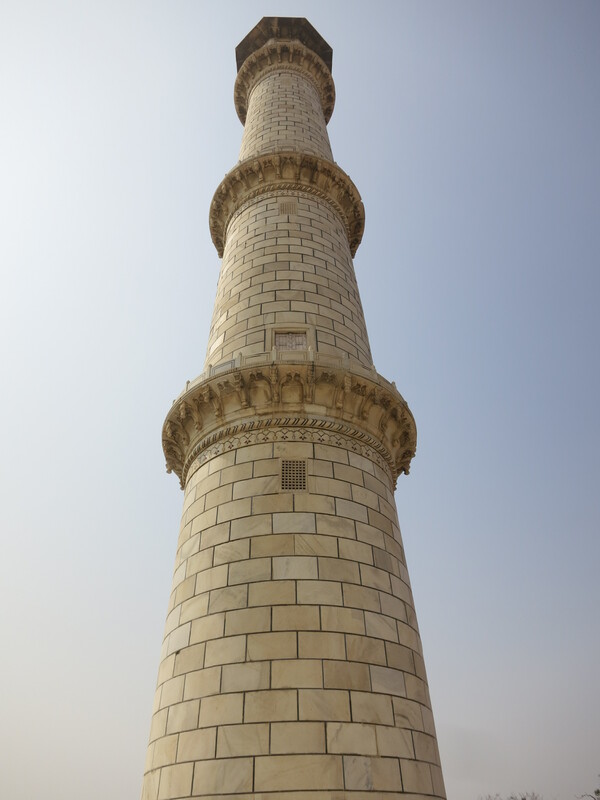 Four minarets mark off each corner of the building, all built to lean slightly outwards, so that in the event that they should ever fall, they will fall outwards and not damage the main building itself. 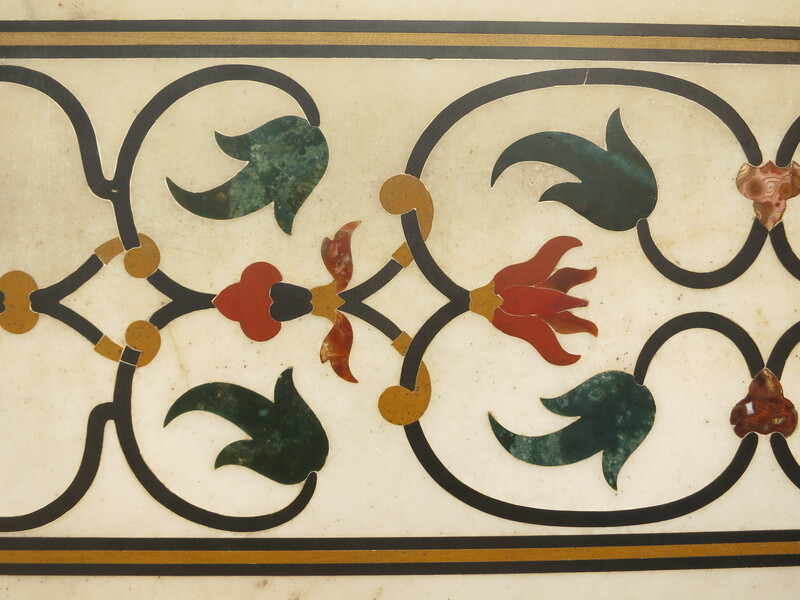 And finally, the majority of the Taj Mahal’s walls are decorated with a combination of floral motifs carved out of the marble face and semi-precious stones inlaid into the marble in intricate designs. 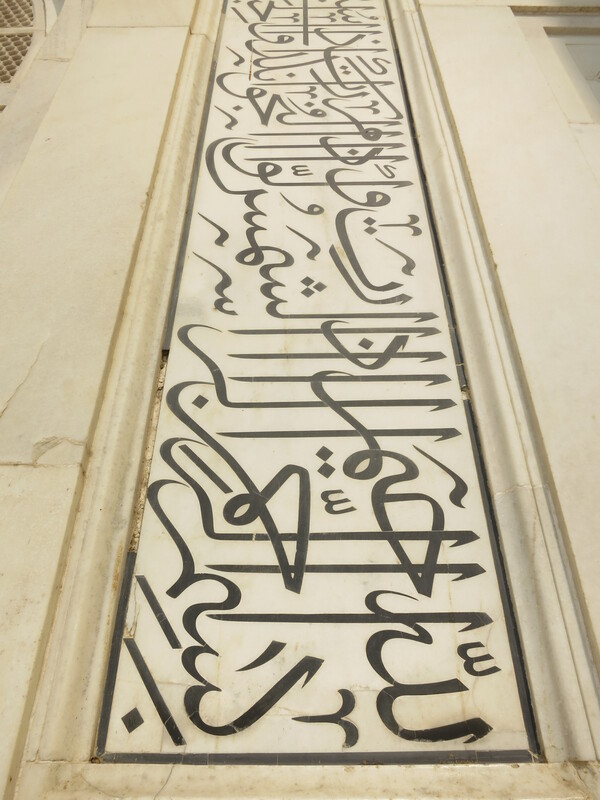 Further decorating the facades are a series of verses from the Qur’an written in a delicate calligraphy and inlaid in Jasper. As another fun fact, the text column actually gets wider as it nears the top of the building, tricking the eye into making it look uniform all the way up. 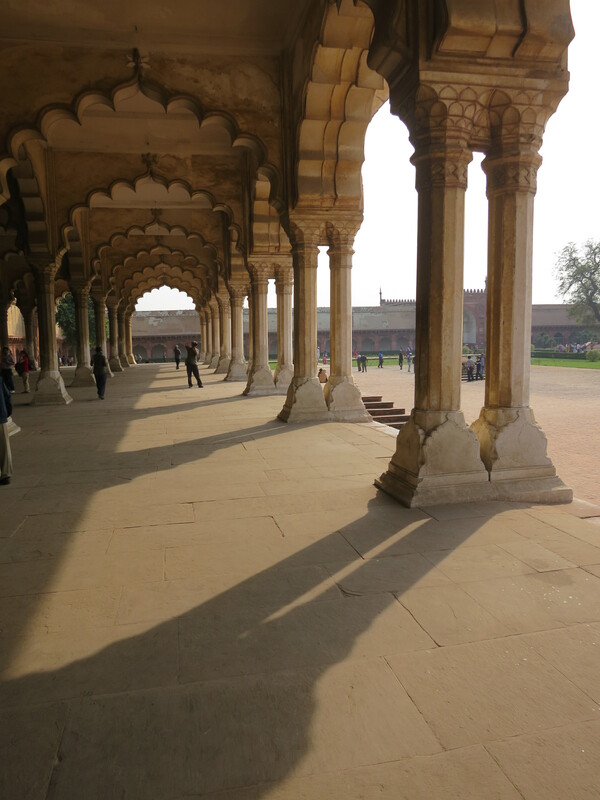 Having passed through the Taj Mahal and Agra Fort, here are a few more random photos from the day for your enjoyment. 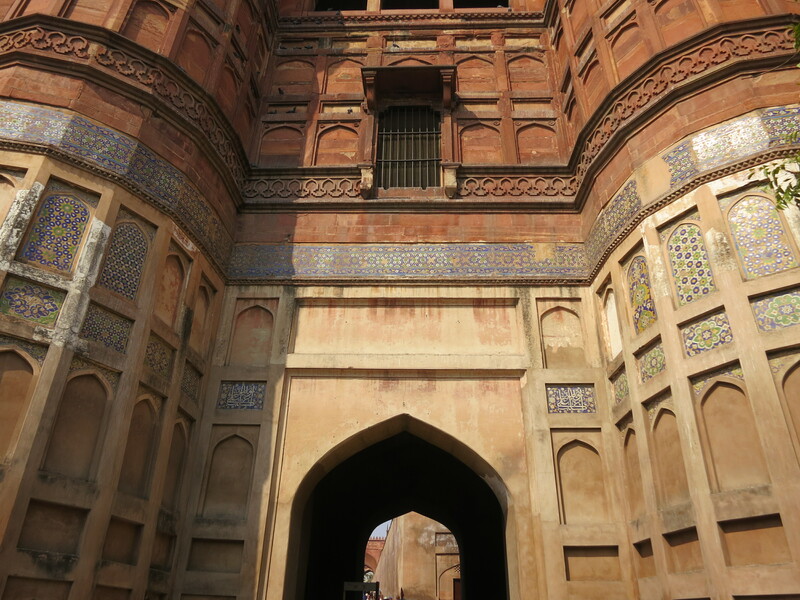 After Agra, I’m heading West into the State of Rajasthan to take in the Forts and Temples in the cities of Jaipur and Jodhpur. 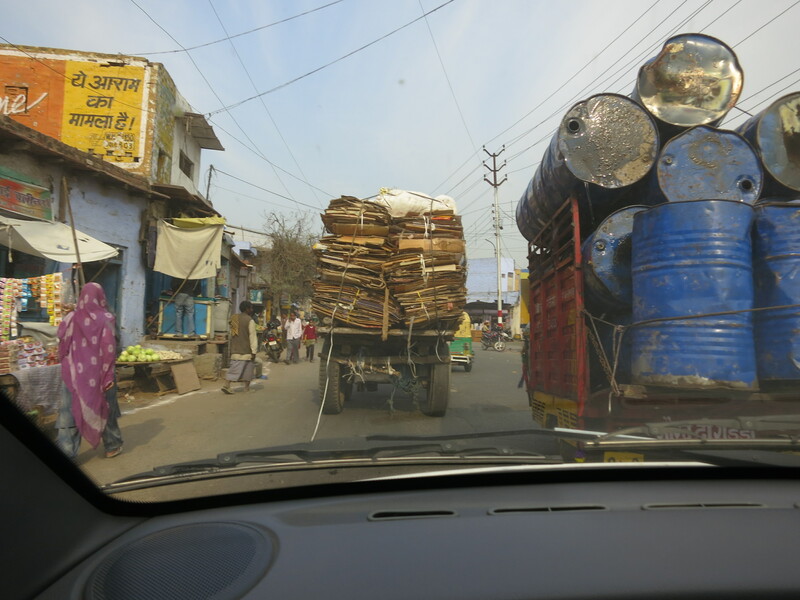 Until then, Cheers from Agra! Good to see a portrait and my comment was not in vain. The key is direct your subject, flat or side light and usually against a plain background. It was your comment that spured me to take more portraits. And I’ve taken more than I’ve posted (not all turned out as I’d like), but I am definitely working on it. Thanks again for the encouragement! I think you chose the correct two to visit. 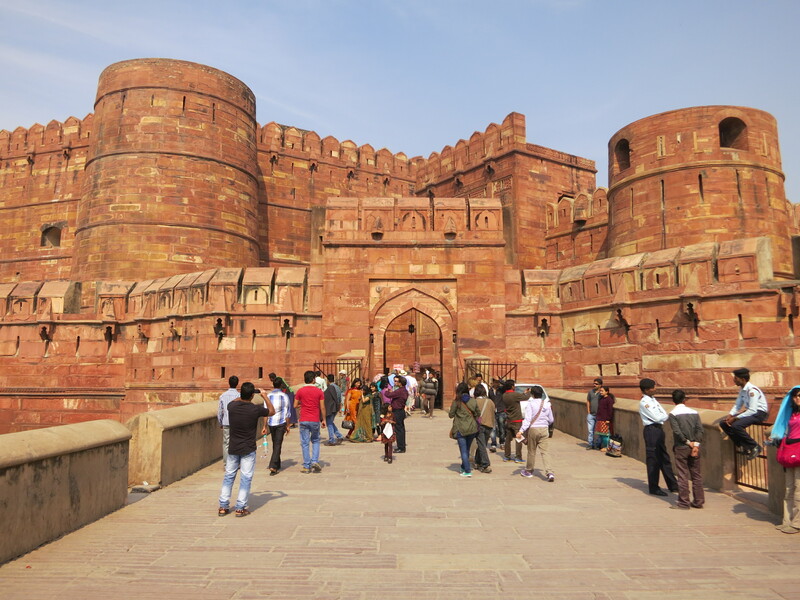 Fatephur Sikri is ok but not on a par with the Taj and the Fort. 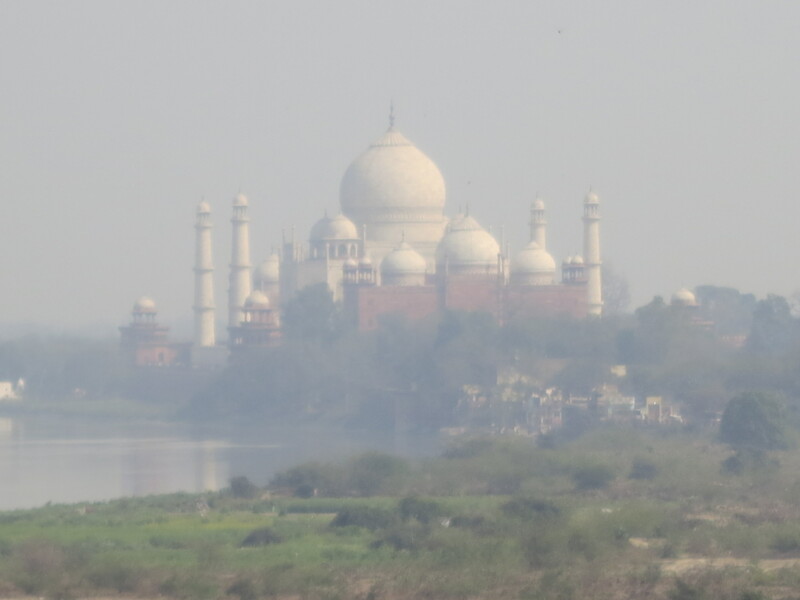 And proof that you can see the Taj from the fort..the smog hid it on my visit. Enjoy Rajasthan. 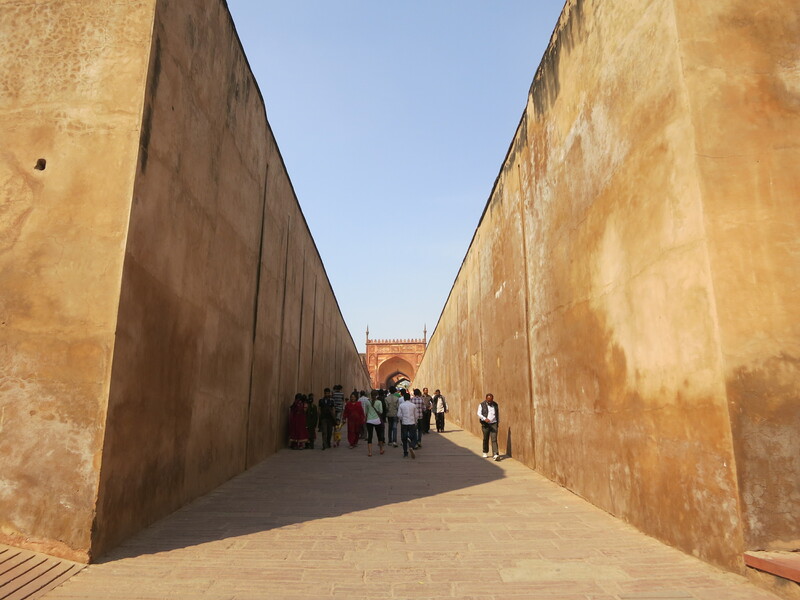 If I am in time try and go to the Jantar Mantar (the observatory) in Jaipur. 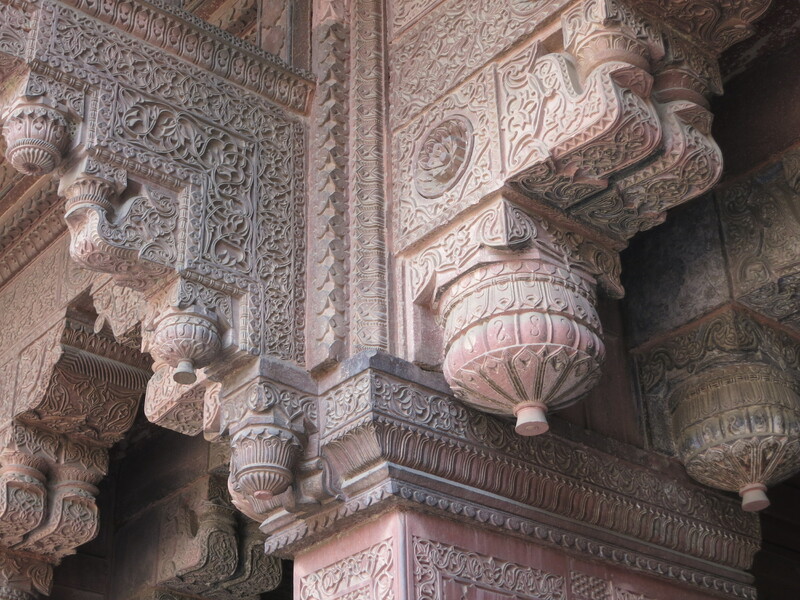 You can marvel at the mathematics,calculations involved as well as the the objects themselves: they are stunning pieces of architecture in their own right! Thanks for the reblog — I always appreciate the extra exposure! Thanks, it was an easy subject to photograph! 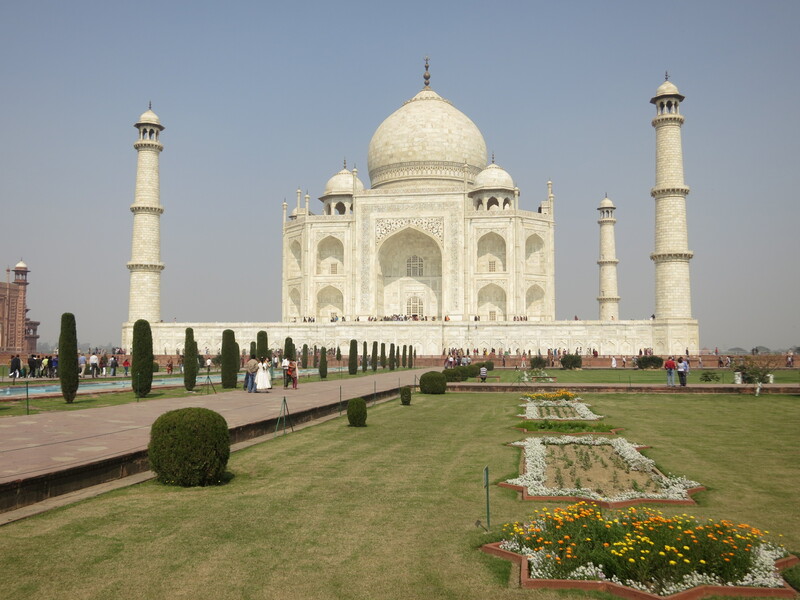 I have to agree with your sentiment there — the Taj Mahal does live up to its reputation! 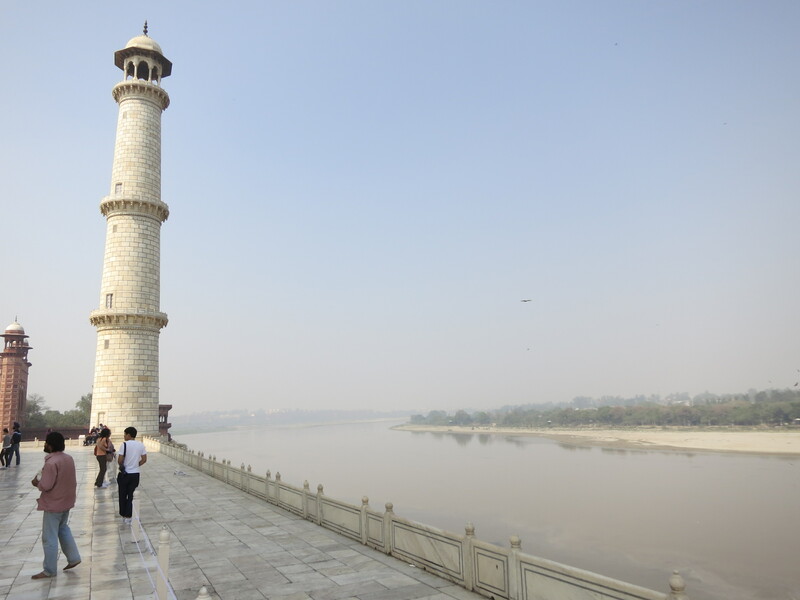 My itinerary isn’t fully developed yet, but Varanasi is way up on my list — and getting the chance to visit during a once-in-a-12-event would make it ever more special. Thanks for the recommendation! Wow Andrew! 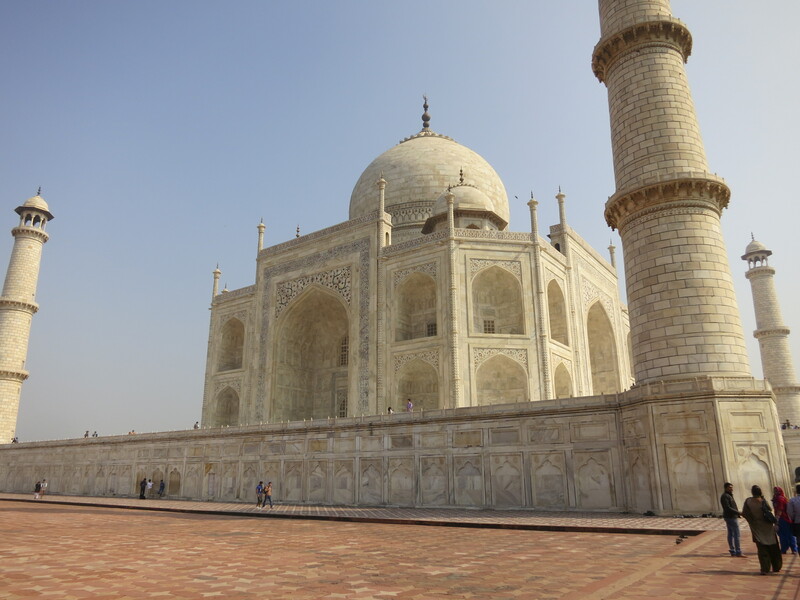 You captured some beautiful photos of Taj Mahal! 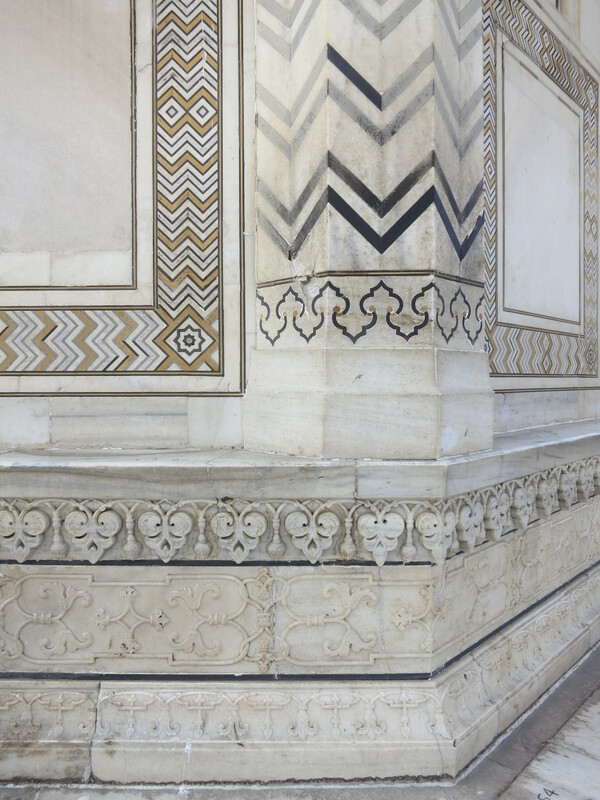 In fact I have never seen some corners and details of the famous mausoleum as your pictures show. 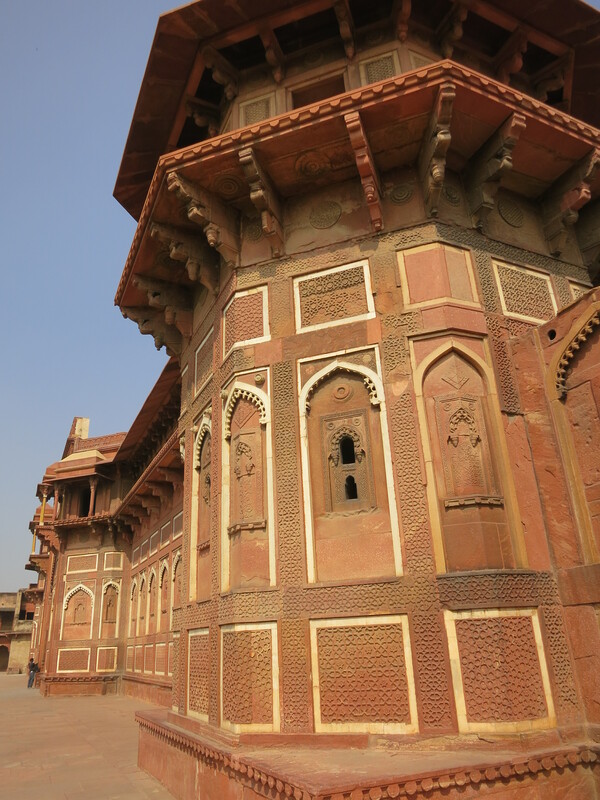 As for Agra Fort, judging from your photos this place should be in everyone’s list as well. It looks stunning! 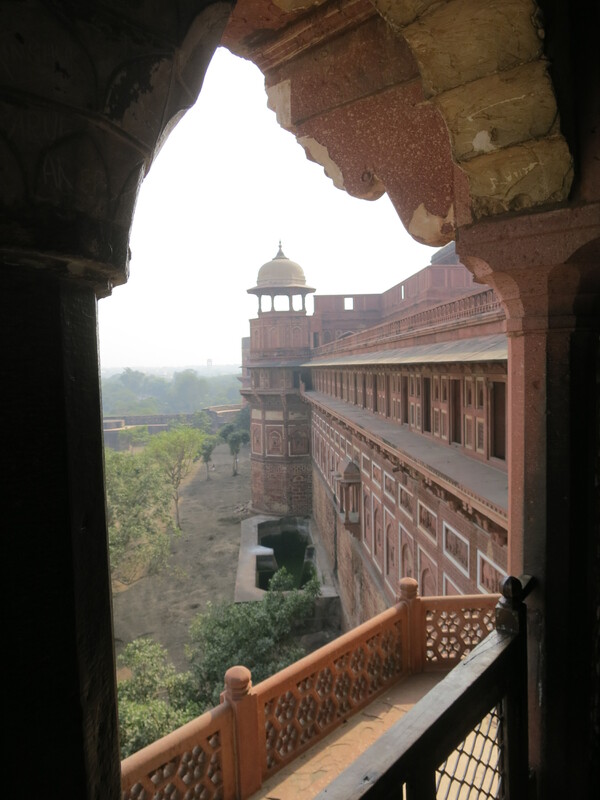 I was surprised at how enjoyable the Agra Fort was, too, considering I had only ever heard it referred to in passing when doing research. 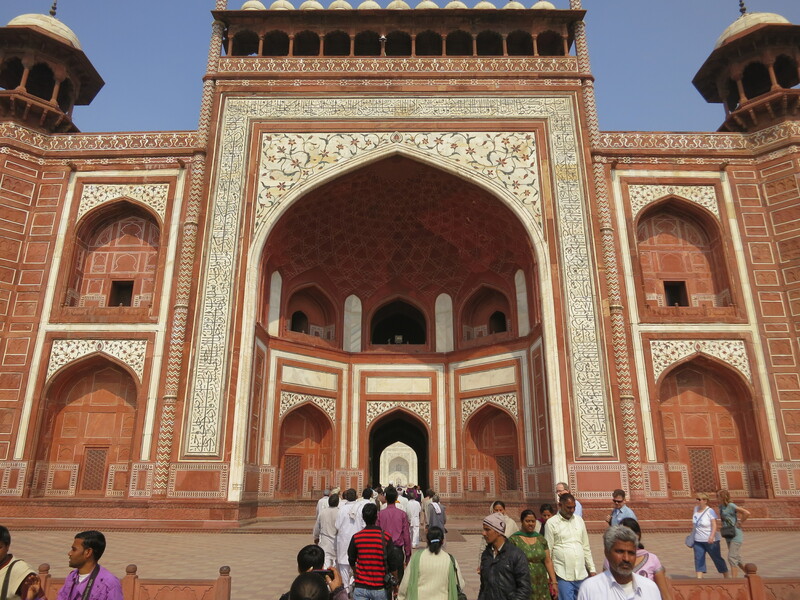 But then again, the Taj Mahal is pretty special, so it isn’t hard to see why it lavishes most of the attention. Thanks again, Bama! Andrew – Very informative article and great pictures! 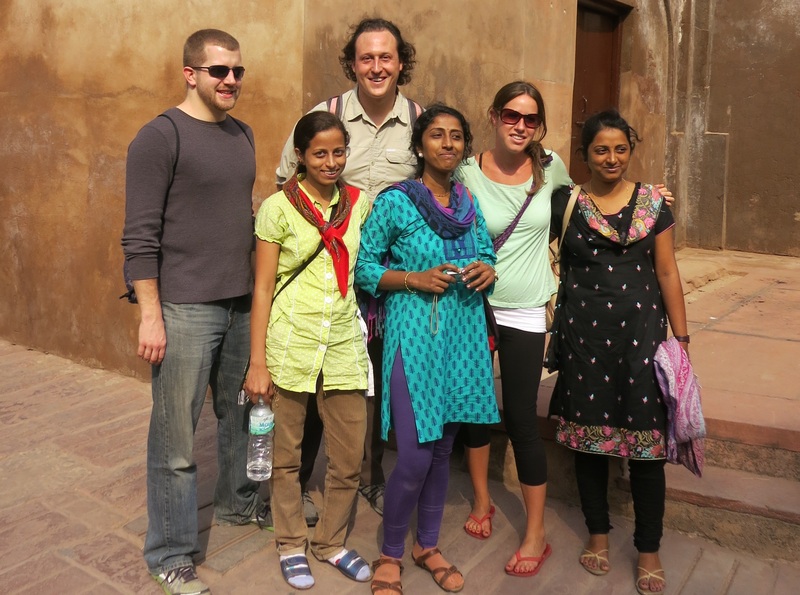 All the best in Rajasthan! These are some gorgeous photos! 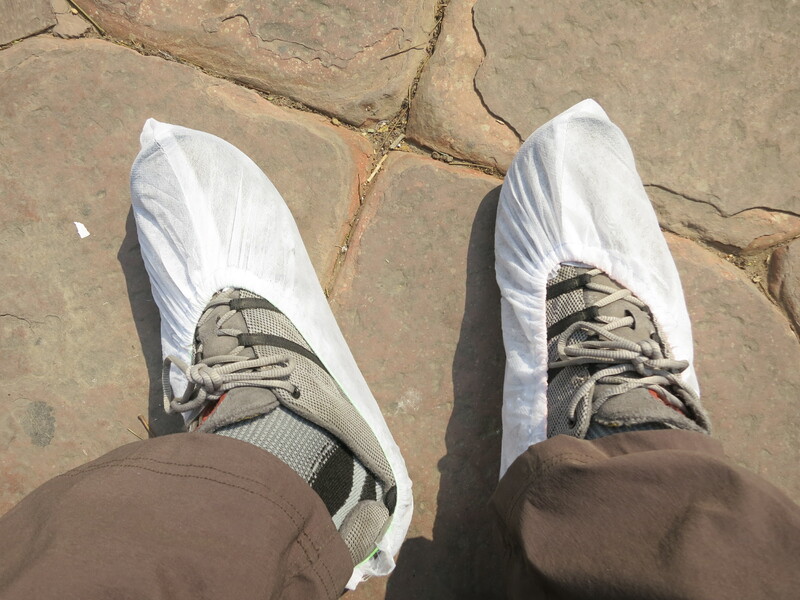 I particularly like those of Agra Fort. 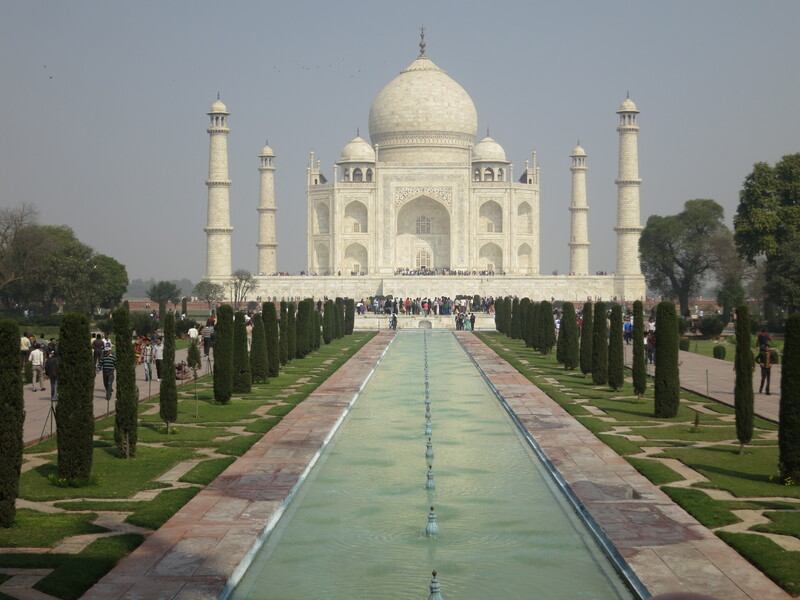 It’s a stunning building that often gets overlooked in favour of the Taj Mahal (itself beautiful, don’t get me wrong). 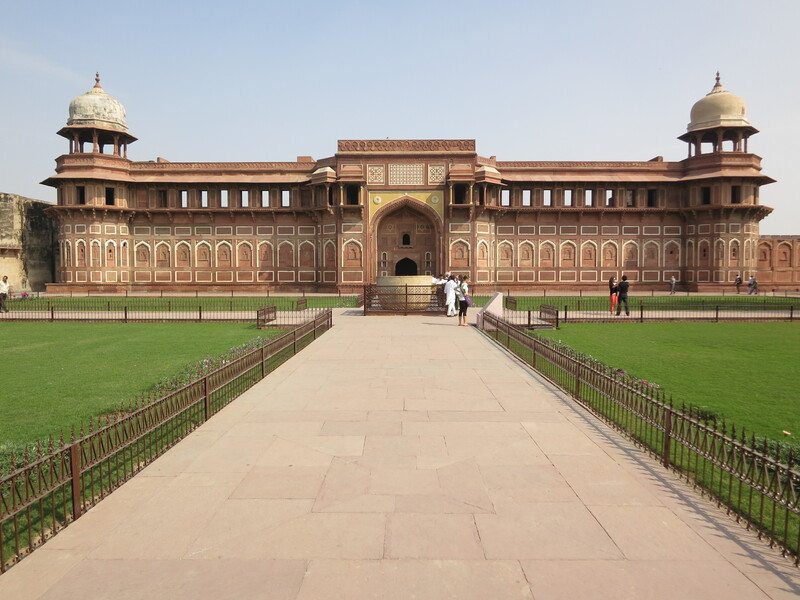 I couldn’t agree more — the Agra Fort is an amazing sight and in of itself. Thanks for reading! 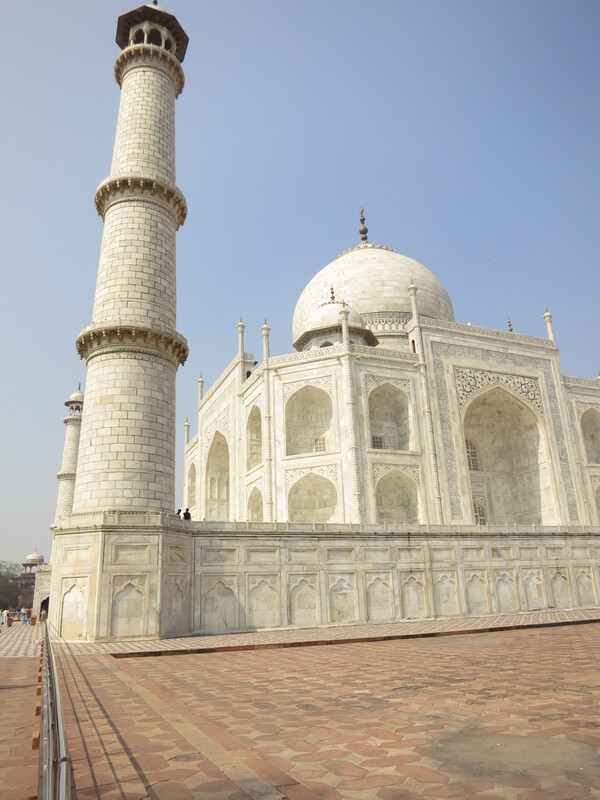 Not quite like Dixon’s Taj MaGarag in Dayton.